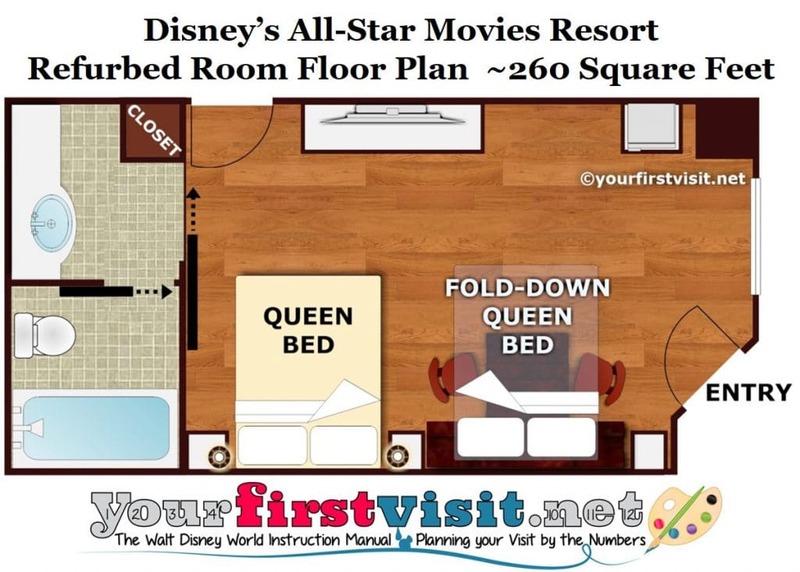 Disney’s All-Star Movies Resort kicked off a room refurb project in early 2018. As of the moment, rooms in five of Movie’s ten buildings–both Toy Story buildings, both Love Bug buildings, and Building 8 in Fantasia–are complete. Refurbs after those have not yet begun. A photo tour of one of the refurbed rooms begins here. Among my 150+ stays (so far!) in Walt Disney World resort hotels, I’ve stayed at Disney’s All-Star Movies five times, most recently in September 2018. 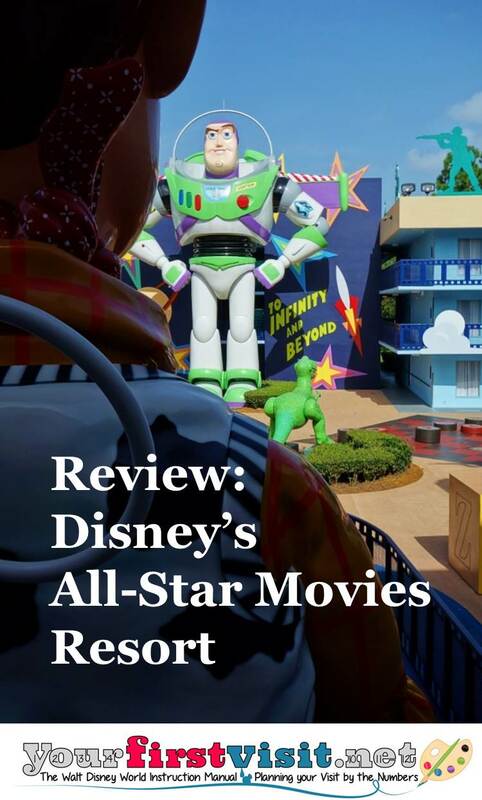 This last stay confirms that for those who can’t afford a deluxe resort, Disney’s All-Star Movies Resort is the third best place to stay among the value resorts (the best value resort choice is Disney’s Art of Animation Resort). 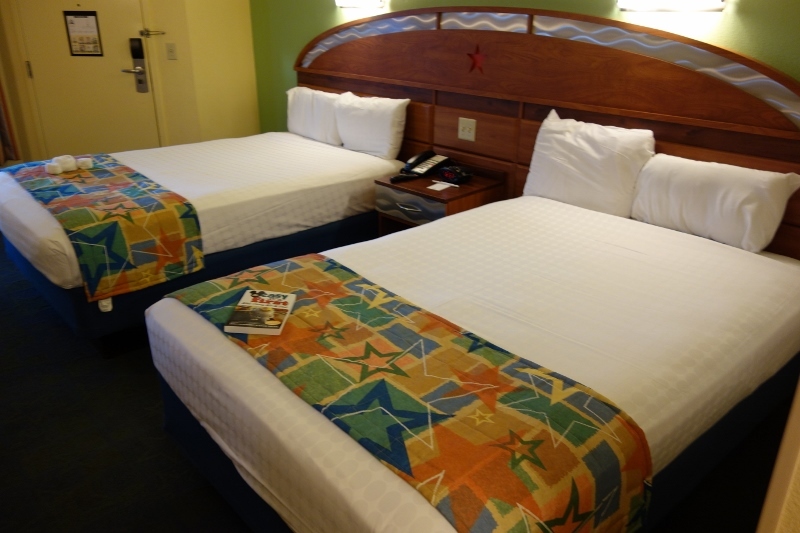 Compared to other Walt Disney World owned and operated resorts, the value resorts are distinguished by having the lowest prices and smallest rooms. 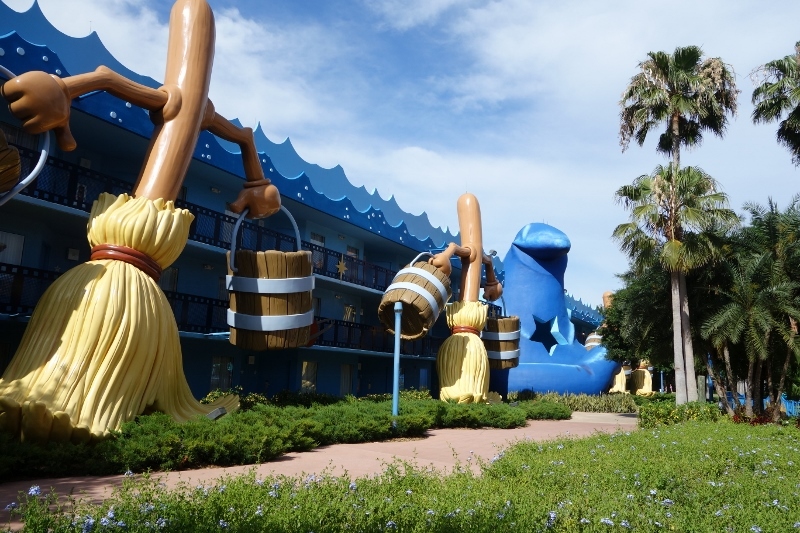 Disney’s Art of Animation Resort is number one among the values. After Art of Animation, the rank is, in order, Pop Century, All-Star Movies, All-Star Sports, and All-Star Music. 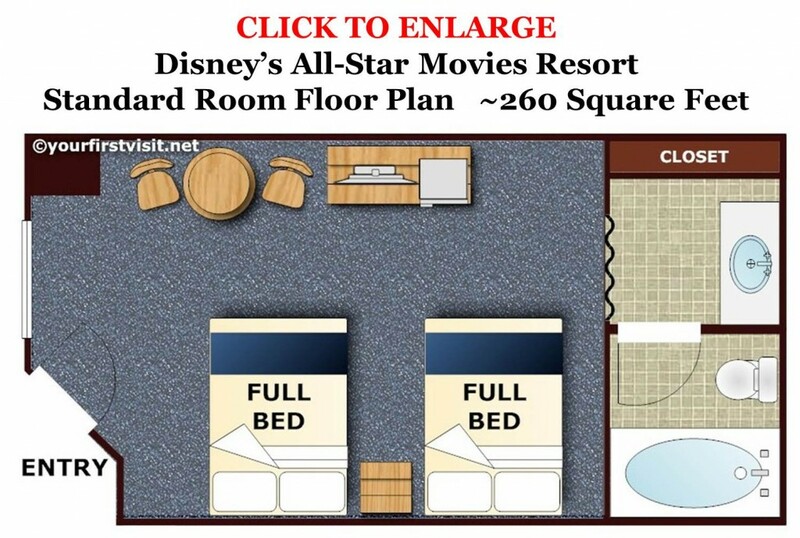 All-Star Music is the most compact, loveliest, and the only one of these three with family suites (Art of Animation also has family suites). 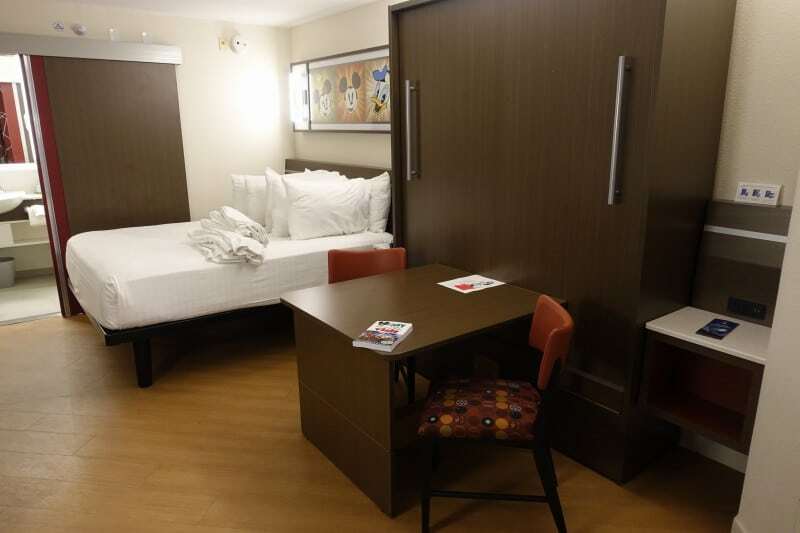 You likely will never stay in a hotel with smaller 2-bed rooms. Refurbed rooms sleep four plus the crib, in a fixed queen bed and a second queen bed that folds down from the wall, eliminating the table when it is down. Floor plan above, image of the room with the second queen folded up below. A full photo tour is here. 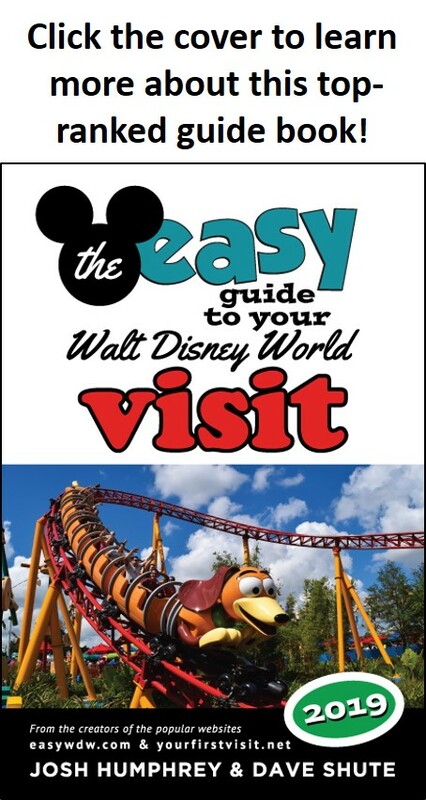 Note that the long-time travel agent partner of this site, Kelly B., can help you book your Disney World vacation at All-Star Movies or anywhere else–contact her at at KellyB@DestinationsInFlorida.com or 980-429-4499. On this basis, Disney’s All-Star Movies Resort is the third best value resort for first time family visitors, after Art of Animation and Pop Century. Kid Appeal. Several of the deluxe resorts–notably, the Wilderness Lodge, Animal Kingdom Lodge, and Polynesian Resort–have spectacular kid appeal. None of the moderates do. All of the value resorts–Disney’s All-Star Sports, All-Star Music, and All-Star Movies, and its Pop Century and Art of Animation Resorts–have terrific kid appeal. Of these, Disney’s All-Star Movies is the third-most kid-appealing. Art of Animation has the most kid appeal. Its ten three-story buildings (all with elevators) are grouped into five areas, each area themed after a movie (two buildings each): Fantasia, the Mighty Ducks, the Love Bug, Toy Story, and 101 Dalmatians. You’ll find scattered around the resort three story high statues of Pongo and Perdita, Buzz Lightyear and Woody, a pool shaped like a hockey rink, and more! The kid appeal of All-Star Movies is based on its theme: because it is about movies, it presents more richly Disney’s visual world. That said, of all the movies ever released by Disney at the time it was built, the resort taps into only a few with widespread, multi-generational kid appeal. In a bit of bad synergy, the movies showcased were released, or had theatrical or made-for-television sequels released, between 1996 and 1999–when All-Star Movies opened. As a result, the only reliably kid-pleasing themed areas are the Toy Story (buildings 9 and 10) and 101 Dalmatians (buildings 1 and 4) areas. Your kids may differ–and be particularly charmed by Fantasia, the Mighty Ducks, or The Love Bug. But most aren’t. Disney does much better at Art of Animation, which showcases Cars, The Lion King, Finding Nemo, and the Little Mermaid. Convenience. 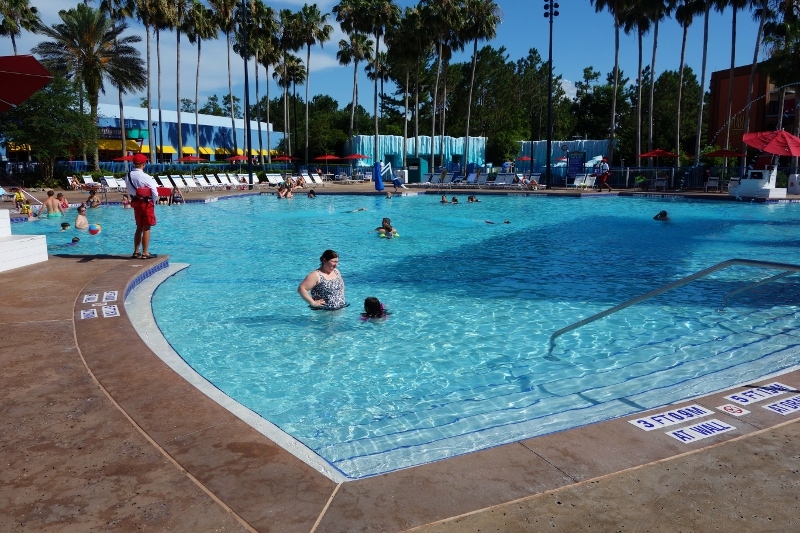 Disney’s All-Star Movies Resort is the fourth most convenient of the Value resorts. During some less busy periods, the three All-Star Resorts share buses, except for the Magic Kingdom, to which each has its own bus. Shared buses stop first at Sports, second at Music, and last at Movies. What this means for Movies is that you have a shorter trip to the parks, but a longer trip back, than Sports. For me, a shorter trip out is more valuable than a shorter trip back. On the other hand, shared buses may fill up before they even get to Movies, or, more likely, have standing room only. This is why I rank Movies after Sports in convenience. The single exception is visitors to the Animal Kingdom Lodge, who should always pay for savanna views. 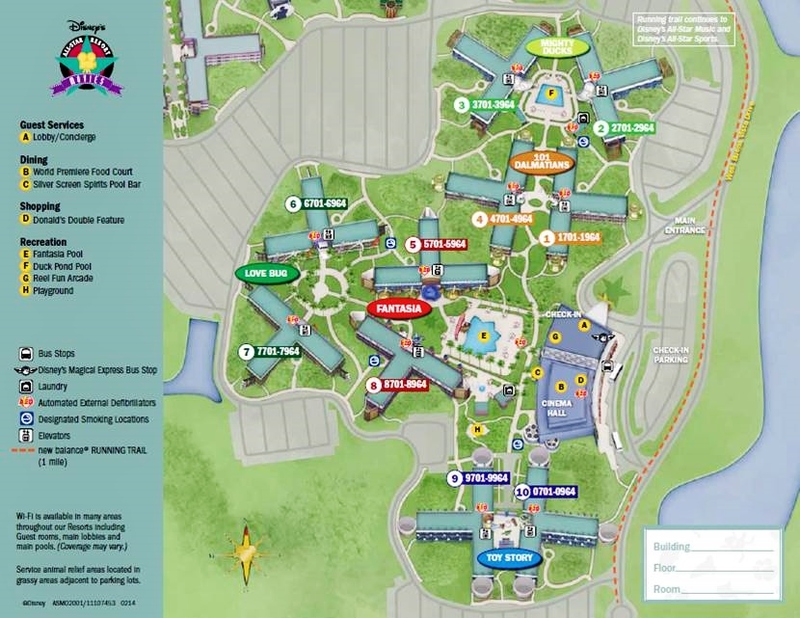 Disney’s All-Star Movies Resort is divided into five areas. Click the map to see the general layout. 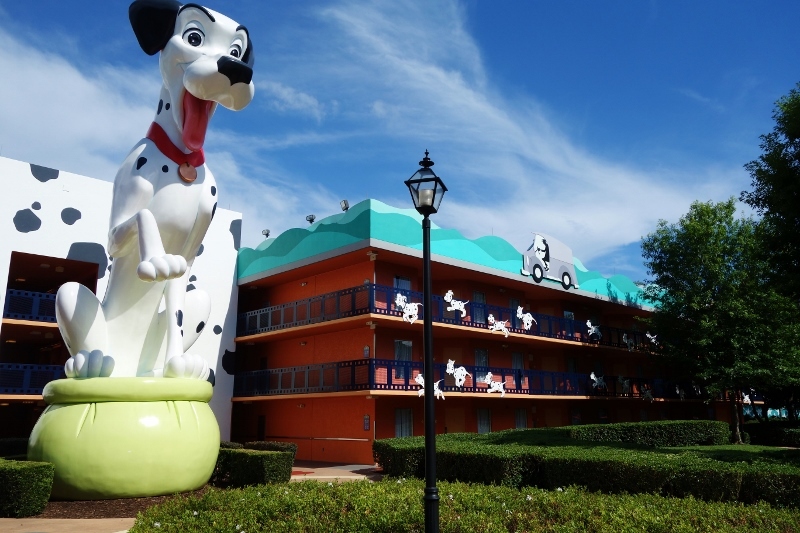 Of these, a third floor room in buildings 1 or 4, in the 101 Dalmatians area, or 9 or 10 in the Toy Story area, is the best place to stay. Movies has the same problem the other values do: it can be packed with teenagers who are at Walt Disney World as part of a tournament or other sports event. As a result, the resort can be very loud and boisterous. Buildings around the pools are particularly so. This leaves buildings 1 and 4 in the 101 Dalmatians area, 9 and 10 in the Toy Story Area, and 6 and 7 in the Love Bug area. Of these, buildings 1, 4, 9 and 10 are closer to the dining area, bus stops, and main pool, and have themes more broadly appealing, and are hence recommended. Ask for the third floor because it is also the top floor, which makes it quieter. The room request form (click it to enlarge it) does not let you ask for building by number, just theme and floor. Families than cannot afford a deluxe resort, or who are otherwise on a tight budget, who can fit into its small rooms, and find the movies noted an attractive theme. Families who are tall or otherwise won’t fit into full-size beds, or who have more than two adult-sized people, or who will be using a crib. Thank you for your reviews. This helps me with my guests who can’t decide between resorts. Thanks for the reviews, my client is deciding between places to stay and this helps alot. You bet, Mario–I’m glad they help!